Beautiful Freaks: Ramones & Boat Shoes. So as you may have noticed, I have now decided to label my outfits instead of put in the date. A lot of bloggers do this and although I'm not one for following trends, I do think it's a wonderful idea. For this outfit, I opted for something casual and comfortable, since this was the first day of my road trip to California. 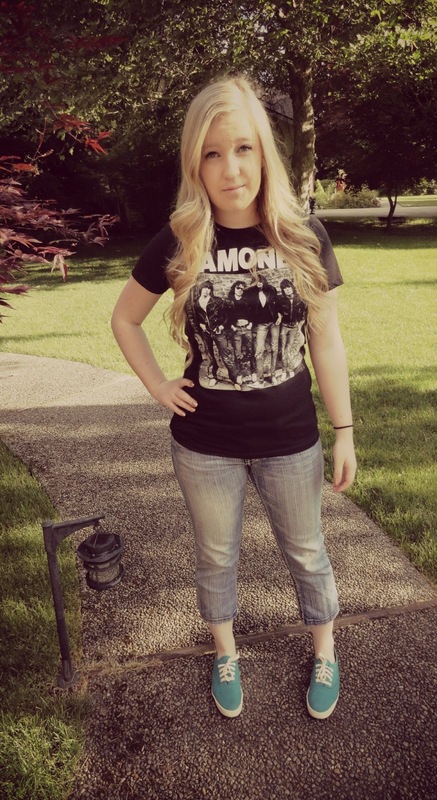 I love wearing band T's, especially from vintage bands like Ramones. It is all about being comfortable on a road trip and you look just that. You look nice and i love how the blue sneakers with it. Pretty. I'm a pretty big fan of the Ramones. Not as much as my girlfriend's friend is, though. She has original concert Tee's from her father. They showed me when I was over last time and my jaw literally dropped. But you're rocking it pretty good there. Like Leslie said, it's an everyday look. But it's a good one for you. Have A Nice Day! :) . Simple theme. Powered by Blogger.